With all that we have to do in a day, it isn’t easy to take time out for relaxation, but the health benefits are definitely worth it. I’ve gotten some great questions from clients about relaxation and thought a quick Q&A review could help encourage you to commit to a daily relaxation practice. What benefits can be gained from relaxation? How does relaxation improve health? When we’re truly relaxed, the body sends signals to the brain that we are content and safe. Heart rate slows, breathing is deep and steady, muscles relax and blood pressure is regulated. These physical changes allow the brain to shift out of activation mode (fight or flight) and into a neutral, balanced state – which then allows cortisol levels to lower. When we’re in fight or flight, our brain is laser focused on essential survival functions – ready to defend and preserve. When we relax regularly and shift into neutral, it reduces stress on the body and brain and promotes a more balanced state, even after the relaxation has ended. When our brain is in neutral and no longer over-activated, we’re able to live our lives more comfortably and joyfully, with greater health – and we have an improved capability to respond to an urgent matter when necessary. Isn’t relaxation the same thing as sleep? No, sleep is critical for health too, it just serves a different function. The brain is very busy as we sleep – communicating with the body and converting short-term memories to long-term. One of the values of doing relaxation when you’re awake is that it teaches the brain to move out of the higher frequency activity while you’re alert. Being calm and relaxed during the day in contrast to being action-focused is a way of informing the brain that we are not at risk, so the brain can commit resources to all “non-essential” functions (like being calm, experiencing happiness, and digesting food properly). How long do I need to relax each day? To really give your brain a clear indication that you’re safe and are well served in neutral, it’s best to relax about twenty minutes, once each day. This give you enough time to get into a relaxed rhythm of breath and achieve a slower heart rate. You can also leverage this relaxation practice at stressful times throughout the day by taking in three or four expansive breaths and exhaling fully. Does watching TV qualify as relaxation? Unfortunately, it’s not that easy – watching television or listening to your favorite music doesn’t qualify as true relaxation. Although it may get your mind off of the stress of your day, it doesn’t provide the improvement in heart rate variability, breathing, cortisol levels and muscle tension. A good way to begin deep relaxation is to spend twenty minutes relaxing in a comfortable, seated position focused on your breathing. If you begin thinking too much, just let the thoughts pass and direct your thoughts back to breath. When is the best time to relax? The good news is – you can benefit from relaxation anytime of the day. When you’re first starting a relaxation routine, I encourage you to plan for it at a time that is most convenient, so you can practice consistently. If you decide to do your relaxation first thing in the morning or right before bedtime, try to do it sitting upright to make it easier to resist falling asleep. When the brain isn’t used to mindful relaxation, it tends to take the relaxation cues as an invitation for sleep. If you would rather plan it for the middle of the day, just find a quiet space where you can sit comfortably and not be interrupted. Eventually you will be able to relax in the midst of chaos, but that’s not easy when you’re first starting! – You don’t need to clear your mind of thoughts, you just want to allow the thoughts to pass rather than engaging in problem solving, planning or remembering. – You can use techniques to help distract you from thoughts – like imagining a peaceful landscape, focusing on your breathing, repeating a positive statement or releasing tension from each area of your body. – It takes time to develop the skill and begin to feel the changes from relaxation. Once you start sleeping better, enjoying life more and are achieving your goals more easily, you’ll be hooked! 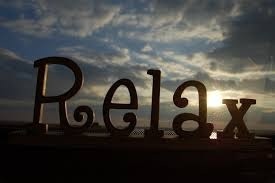 I hope you experience blissful relaxation! Feel free to post questions and comments below.